We're periodically posting short profiles that will collectively provide a starting point for an exploration of international blogs, online magazines, photography-based curation projects, and pages. Today we continue the series with a look at Liberia '77. In a sentence: Liberia '77 works to restore the historic photographic database of Liberia - much of which was destroyed through war - by creating a public collection of personal pre-war images. While filming a documentary based on their childhood in Liberia and while rephotographing family images as part of the project, the Topham brothers discovered that much of the photographic history of the country had been destroyed during 25 years of civil war. In their re-encounters with people in their family photographs and with others, they discovered the importance of pre-war photographs as showing proof of a once peaceful country and hope for a better future, giving the recuperation of the country's pre-war images a role in the healing process of a damaged nation. 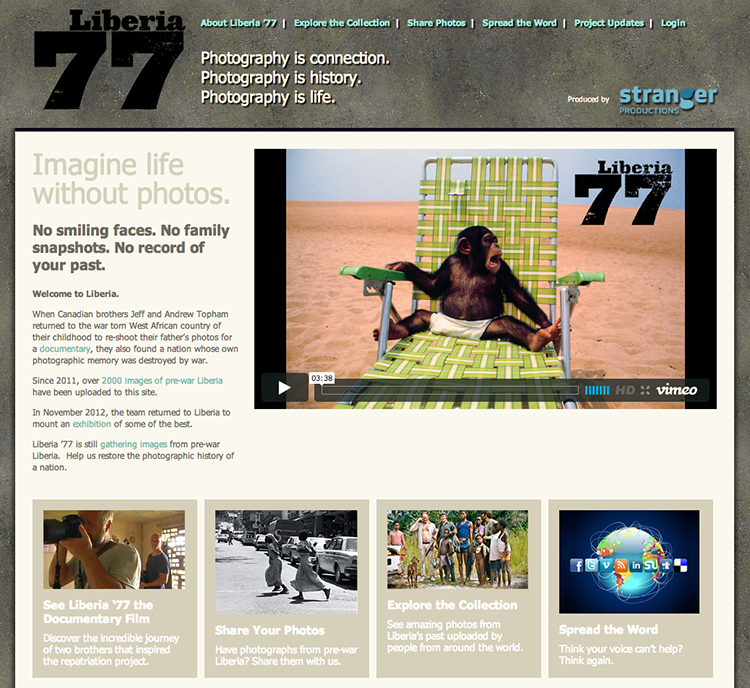 The site Liberia '77 is an auxiliary project for submitting images from pre-war Liberia to create a public database of images. Liberia '77 can be found on Twitter and Facebook.